Paintball Aberdeen is a great way to have fun and exercise and Aberdeenshire is ideally situated to offer various paintball venues in a range of forests, indoor paintballing and paintball centres. Below About Aberdeen have added the various paintball Aberdeen locations, paintball prices and paintball kits; each with a paintball review. This paintball Aberdeen venue also offer other outdoor activities such as archery 4 x 4 off road driving, fishing zorbing, hovercraft driving and quad biking at their Aberdeen Activity Park. An About Aberdeen review will be added to the site soon. Visit www.aberdeenactivitypark.co.uk for more information. Battlegrounds Paintball Aberdeen is based at Druggam Woodlands Banchory in Royal Deeside, a pleasant 15 minute drive from Aberdeen City. The advantage of this Aberdeen paintballing location is the rural location set in 35 hectares of secluded woodland. Battlegrounds Paintball offers paintballing experienced ranging from children parties, stag parties, hen parties, group paintballing and corporate team building days. This North East of Scotland paintballing site, just 13 miles from Aberdeen City Centre, has the unique feature of the first replicated World War Two trench system in Scotland. The added attraction of this paintball Aberdeen location is that Battlegrounds Paintball has many other paintballing games that are not army based. These paintball Aberdeen themes include a haunted village, medieval castle, king of the hill and woodland paintball scenarios throughout Druggam woods. There are still many military themed paintball scenarios and missions to play out which include fuel dump attack, trench warfare and behind enemy lines. Prices for this paintball Aberdeen experience start from �30 per person and includes the use of the Tippmann 98 paintball marker, 200 paintballs, freshly laundered camouflage coveralls, head protection and an anti-fog mask. Extra paintballs are available at the cost of �5 for 100 paintballs. A discounted price can be offered for group bulk buying of additional paintballs. Battlegrounds Paintball recommend wearing comfortable footwear like trainers or boots and wearing old clothes that you don�t mind getting dirty. Gloves are also highly recommended to keep your hands protected, dry and warm. Additional weapons, ammo and paintball equipment can be purchased from Battlegrounds Paintball at Druggam Woodlands Banchory and this includes pyrotechnics such as smoke grenades and thunder flashes from �3, a battle pack that can carry up to 400 additional paintballs ammunition for a �5 refundable deposit, armoured gloves with back of the hand padded for extra protection for �8-50. Group organisers who arrange at least 16 people to play paintball at Battlegrounds Paintball at Druggam Woodlands Banchory can play for free with 500 paintballs for the day. The opening times of Battlegrounds Paintball vary depending on the booking of the group and the group size, the time of year and the weather. AboutAberdeen recommend visiting the Battlegrounds Paintballs website at www.battlegrounds-paintball.co.uk to make a booking or use their e-mail or telephone number contact information. Facilities at Battlegrounds Paintball at Druggam Woodlands Banchory include a tuck shop which sells a range of snacks to help your energy levels during your Aberdeen paintball experience. Lunches can be supplied from �5 and pre-booked is highly recommended. Battlegrounds Paintball provide protective paintballing equipment and understand that serious and regular paintballers like to use their own personalised equipment. So for serious paintballers Battlegrounds Paintball run a walk on day each month at reduced rates for individuals and paintballing teams from many areas of Scotland. Visit the Battlegrounds Paintball website at battlegrounds-paintball.co.uk for more information. For health and safety and insurance reasons Battlegrounds Paintball is restricted to those aged over 12 years. Those aged between 12 and 16 years will require written consent from a parent prior to paintballing. Only paintballs purchased at Battlegrounds Paintball can be used at Druggam Woodlands Banchory. The Nationwide Paintball website take bookings for Paintball in Aberdeen, Scotland and over 90 UK locations. 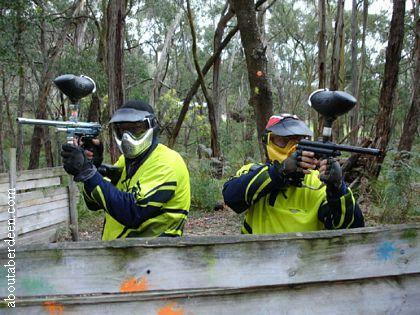 The nearest paintball location to Aberdeen is Aberdeen Paintball which is listed above. There is also a paintball site at Edzell, just off the A90 and about a 30 minute drive from Aberdeen City. The paintballing skirmish fun takes place in a secluded and private area in the Edzell Woods. This large woodland area is ideal to play paintball games and the promoters also organise special scenarios for paintballers such as attacking or defending a specially built shanty town or communications tower. Military scenarios and paintball games include rescuing a downed RAF pilot, having a paintball skirmish or experiencing army type pyrotechnics such as smoke bombs, thunder flashes and paint grenades during paintballing games. The Edzell Paintballing Centre has its own cafe and snack bar for relaxing between paintball games and your paintballing skirmish. Paintball Aberdeen Gamers can buy an all day paintball experience from only �15 with 100 paint pellets costing only �8 or book all day paintballing games and 100 paintball pellets for only �20. An Aberdeen paintball experience is ideal for people looking to have fun, get an adrenaline rush or looking for a group entertainment. Paintballing is ideal for stag or hen parties, for corporate teambuilding or for birthday parties. Paintball Aberdeen Scotland at Edzell Centre can caters for your individual needs and can provide food and drink catering to your needs. The costs of paintballing include all fees other than re-arming for more paint ball ammunition. The cost includes insurance, safety training and all the paintballing equipment you need for the day. Lunch can be purchased at the cafe for only �5 which gives you a tasty bowl of Highland vegetable soup with croutons and a plate of penne pasta in tomato sauce with seasonal salad. The Edzell Paintball Centre is officially called the Bedlam Paintball and is situated between Aberdeen and Dundee. From Aberdeen take the A90 dual carriageway to Brechin and then turn off at the B966 and head through Inchbare to Edzell Woods and Bedlam Paintball is signposted with the brown tourist direction signs that are common throughout Grampian and the North East of Scotland. The paintball Aberdeen Scotland centre is not too far to travel to from Aberdeenshire locations such as Banchory, Peterhead, Aberdeen City, Inverurie, Stonehaven, etc. During your paintball Aberdeen Scotland games you will be provided with a lightweight jumpsuit or a coverall to protect your clothing, a full face mask with have built in goggles and a military type storm trooper helmet to protect your head and eyes. These have anti fog lenses so that you do not mist up as you chase and flee from your enemy. Your Aberdeen paintball clothing is completed with an ammo belt that holds up to 400 extra paintballs held by Velcro to help you reload quickly and efficiently whilst under fire. The last but most important pieces of paintballing equipment are the semi automatic paintball marker gun or rifle that is lightweight, easy to load with an anti jam trigger and the gas propellant hopper which has a 200 paintball capacity. Paintball Scotland takes place in many locations and below About Aberdeen have provided paintball reviews to some of these paintball locations throughout Scotland. Absolut Paintball is out first paintball Scotland location and they provide paintball games at its site located near Glasgow and Stirling in Scotland. The qualified staff at Absolut Paintball are there to ensure you have a safe and fun day whilst you paintball in Glasgow. Absolut Paintball are a leading Glasgow paintball supply provider and can accommodate individuals, groups and corporate parties. Their paintball packages are fully inclusive with no hidden charges so that you can enjoy your paintball Glasgow day out. There are free paintball passes for a group organiser if the party at Absolut Paintball in Glasgow is over 25 paintballers. Prices for all paintballing people include free paintballs and free tea and coffee. Absolut Paintball have been operated as a paintball Glasgow centre since 2003 and the owner, Alick Bennett has a great deal of experience in outdoor pursuits. The paintballing centre is set in 25 acres of private land and each paintballer is given a set of overalls and the paintball equipment needed to enjoy a day out in Glasgow, Scotland. If you run a paintballing centre in Scotland or other parts of the UK and would like listed for free on this page then please add my link to your website and then contact me. Does being hit by a paintball fired from a paintballing gun hurt? It will hurt a little bit and the paintballing equipment is designed to absorb the impact of the paintballs that are fired at high speed. Aberdeen paintball players have described being hit by paintball paint as being similar to being hit by a small sports ball. For paintball Aberdeen locations see above.